Waterloo – The business records of organ builder Gabriel Kney have a new home at the Wilfrid Laurier University Archives in Waterloo. The records document Kney’s custom-built organs, which remain staples in churches, homes and concert halls throughout North America, including Toronto’s Roy Thomson Hall. “I feel so honoured to know that my life’s work will be kept on record. I’m so pleased and so appreciative, because otherwise it would all be gone,” said Kney, who lives in London, Ontario. The Kney compilation joins the Laurier Archives’ robust collection of records specifically related to organ music and sacred music, and its existing collection from the Waterloo Lutheran Seminary and Laurier’s Faculty of Music. “The collection contains the original drawings and schematics of nearly all of Kney’s organs, as well as business files, correspondence, photographs, technical and architectural drawings and concert recordings — all in excellent condition,” said Julia Hendry, head of archive and special collections. Each one of Kney’s instruments is custom built to suit the specific environment. These details are preserved in the collection, which is of particular interest to musicians. Shortly after immigrating to Canada at the age of 21, and with his wealth of organ-building experience from his native Germany, Kney founded his own company with the intention of revitalizing the building of mechanical-action pipe organs — something that was unique in North America at the time — based on historic tonal concepts and construction techniques. One of Kney’s earliest supporters was Ulrich Siegfried Leupold, a theologian, musicologist and former dean of the Waterloo Lutheran Seminary at Waterloo College (now Wilfrid Laurier University). 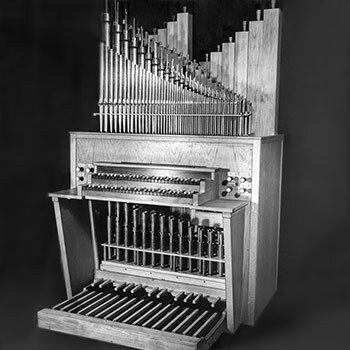 In 1955, Leupold installed Kney’s first mechanical-action organ built in Canada, the Opus 1, at Waterloo College. It was later moved to Aeolian Hall in London. Records about the Opus 1 are included in the collection. Over his 50-year career, Kney custom built 129 organs and became well known as a top-tier artist. “I don’t consider myself artist, but rather a craftsman,” said Kney. Kney’s wife, Mary Lou Nowicki, an organist herself, believes otherwise.